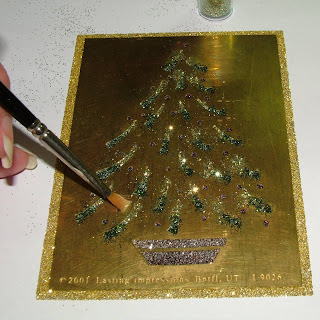 I seem to pull out and play with my glitter more during the Christmas Holidays than any time of the year and one of my favorite glitter art projects combines sticky paper cardstock with brass stencils. 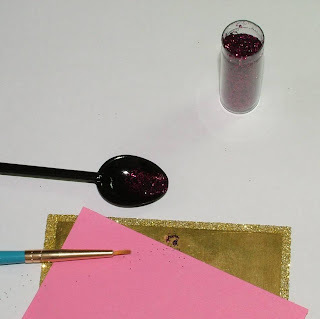 This is a fun but messy process, since glitter has a mind of it's own and seems to hang around your work area for some time to come; so be prepared to sparkle when you are through. 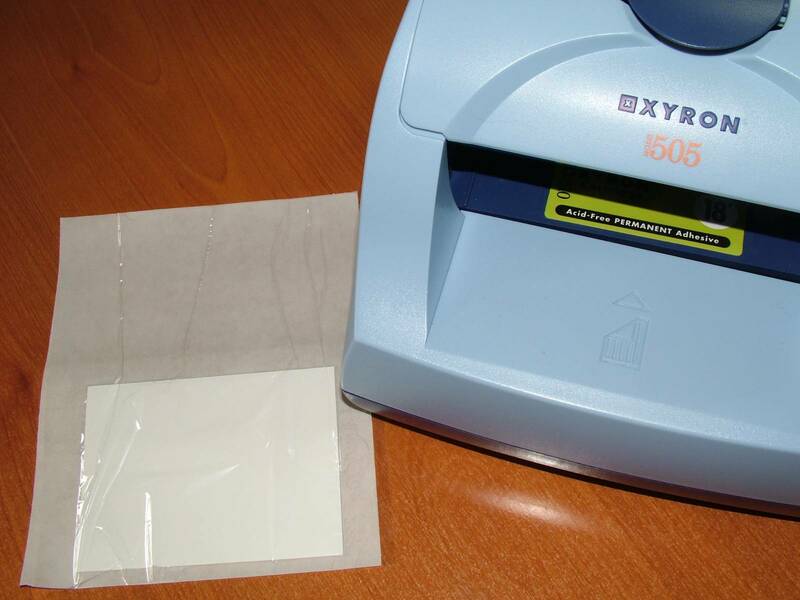 I did this project using my Xyron machine; however I have also done this project several times using sticker paper and that works well too. 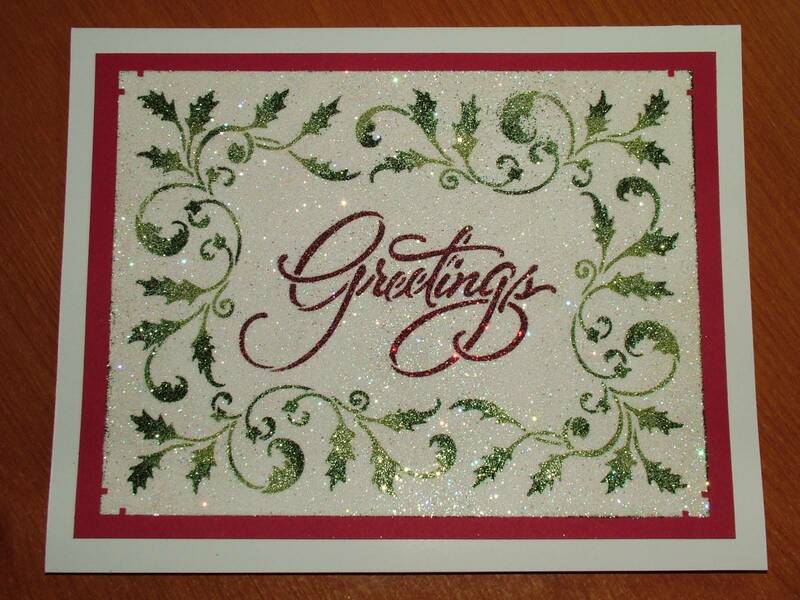 I just find it is easier to do with the thicker cardstock and my Xyron. 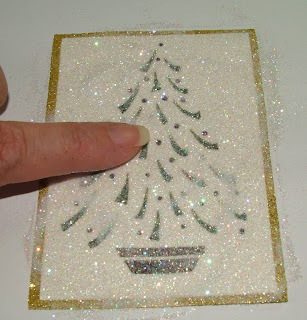 Here are some of the supplies I will be using to create the glittered tree. that has Permanent Adhesive in it. 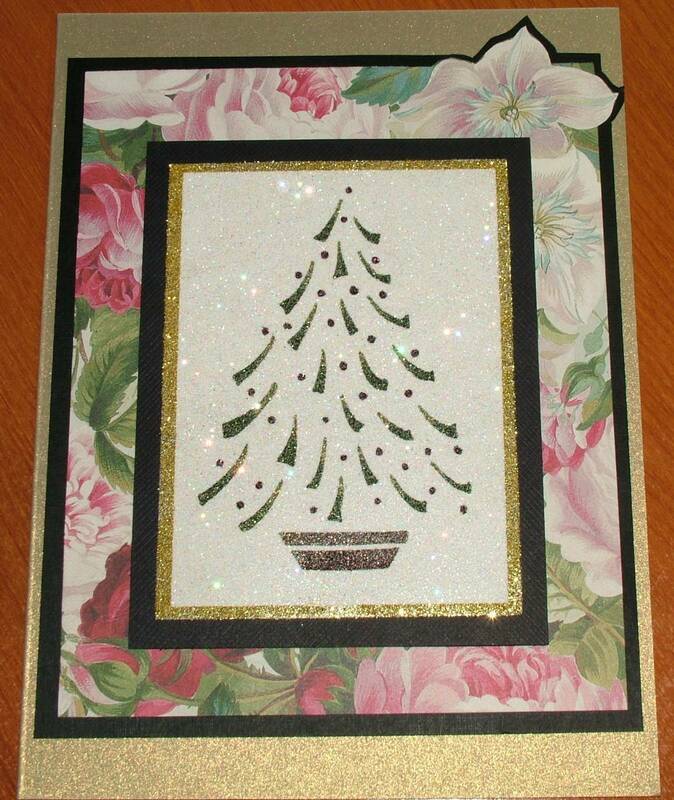 nice glittered edge all around the finished project. I use a few post it notes to mask off the stencil pattern so I can glitter the edges first. 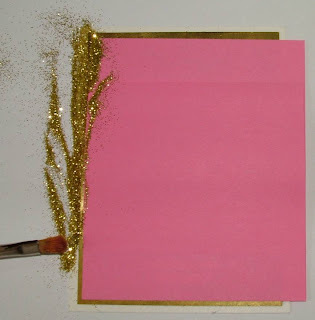 I tap and brush off all the excess gold glitter before removing the post it notes. won't accidentally contaminate my border. from my Monochromatic Pink glitter set to all the balls on the tree. I find a small brush dipped into the glitter works great to get it into each small hole. will determine how labor intensive this process is. I added 2 different brown glitters from my Monochromatic Brown set to the tree base. 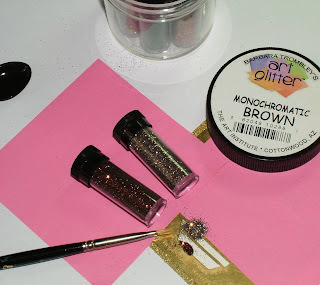 I tap out a small amount of each and then use a brush to push the darker glitter across the lower portion, then I used my fingers to swirl in the lighter golden brown in all the other areas. I press down a bit to make sure I have a good bond. 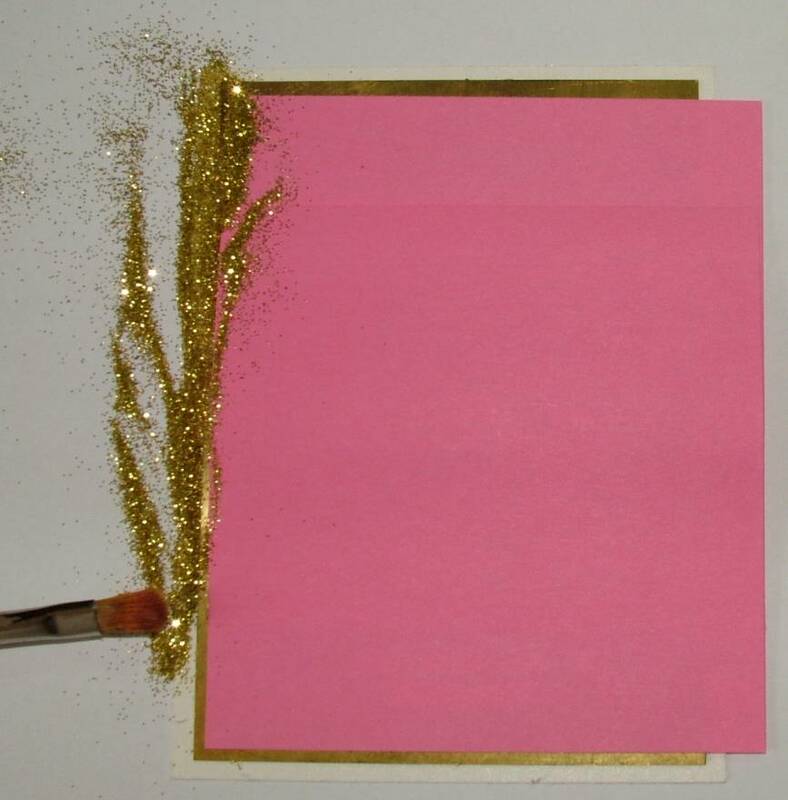 I then tap and brush off all the extra glitter before removing the post it notes. Adding 3 shades of Green Glitter to the Tree - Darkest First. were I want it, on the bottom portion of all the branches. Whew, No post-it-notes are needed from this point forward. 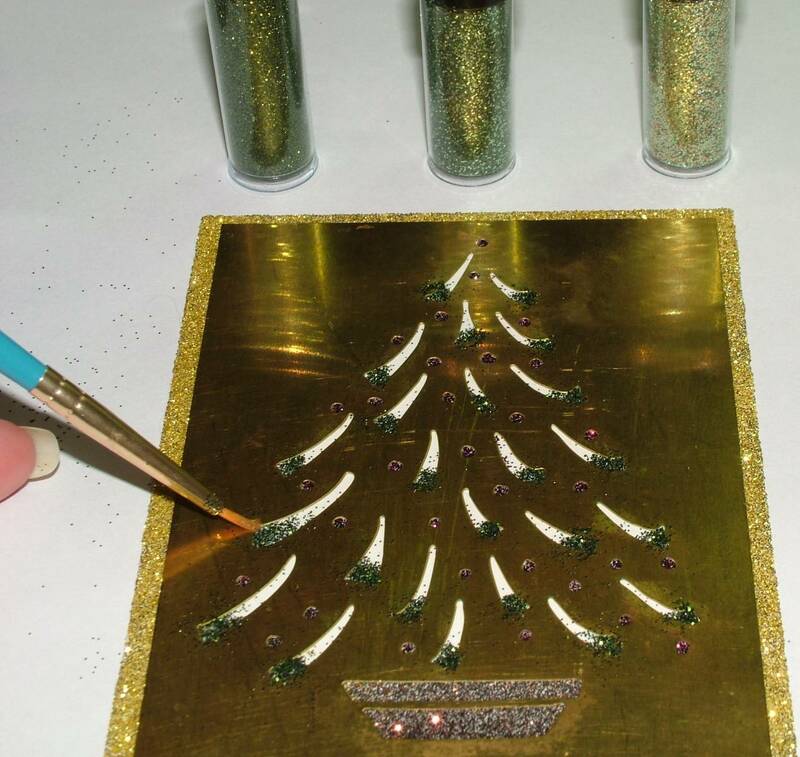 brush to swirl the three shades of glitter in place. is good contact between the adhesive backed paper and the glitter. to lightly scrub away and strays. 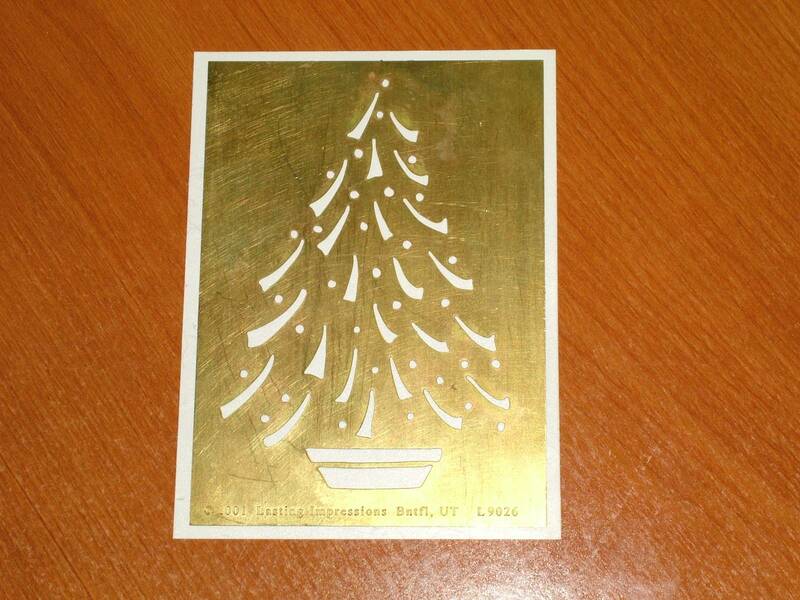 I carefully peel back the paper from the stencil. 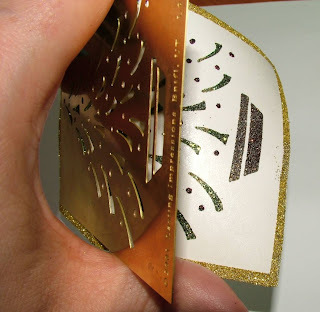 The white areas are still sticky so avoid touching that part of the cardstock. 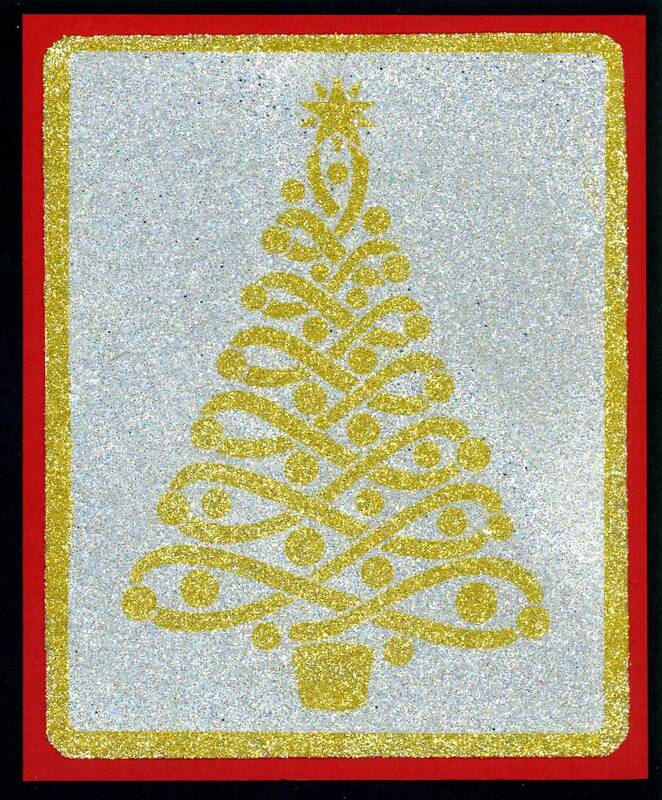 to fill in my background. I use my finger to work in the glitter from the top to the bottom of the project. sticky portion of the background. 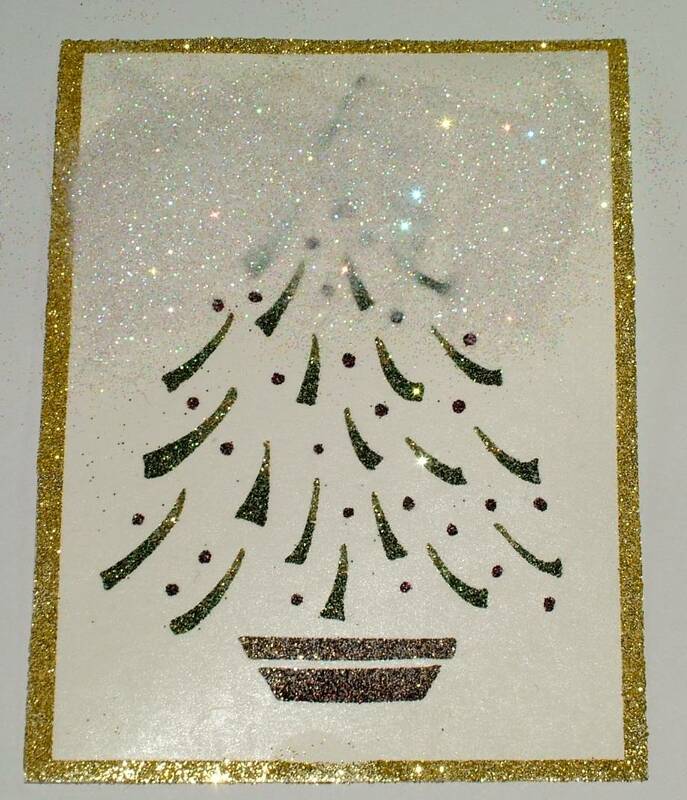 I added a black mat to my finished piece of glitter art. 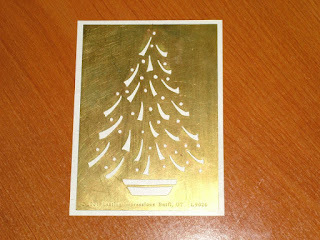 A bit of fun paper and a gold background finish off my Christmas Card. This project took me about 30 minutes because of all the colors I used and the little red balls took the longest part since I had to block off all the surrounding areas as I did that part. 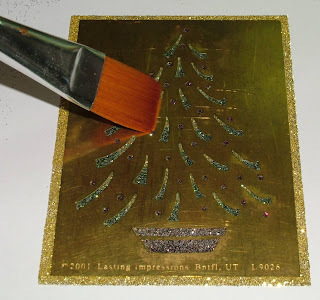 This project could be done in less than 5 minutes if I only used the 2 glitter colors - one for the border and tree and then one for the background. See below. 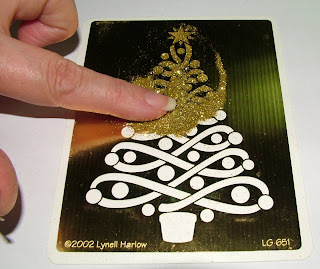 Once the stencil is on the sticky cardstock and I pour gold glitter on, swirl it into all the nooks and crannies and on the border edges. 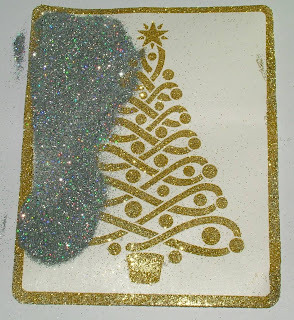 I add more glitter as I need it, press it in really well and then tap off all the excess before removing the stencil from the cardstock. it into the background. I tap off all the extra glitter, mat and make my card. 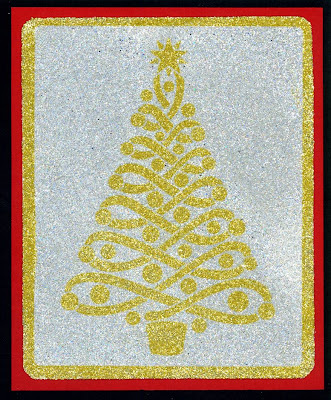 I made this card a few years ago and it was my first try at this process, so it has several issues I wanted to share. The stencil for this project was very large and hard to remove so glitter popped over into the background area and edges during the removal process. 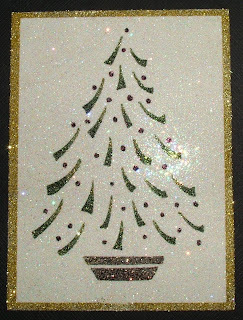 I should have used gold or sliver glitter for the background instead of crystal; since a denser color would have done a better job of hiding the over spray of color you see peppered thought the background. 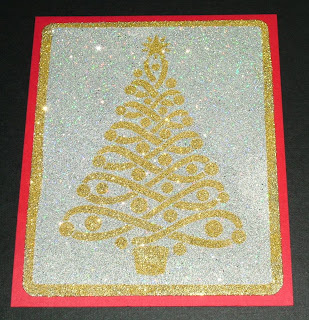 I also did not cut my cardstock to have a border, so as I removed the stencil the sticky edges were picking up stray glitter. 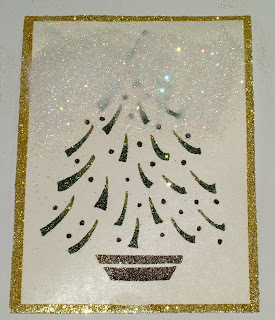 This is why I now add a border and glitter it first. 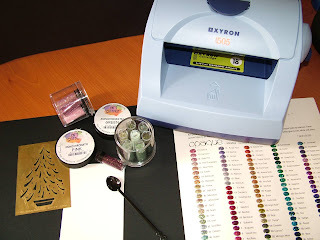 What I do like about this first try is the bright pop of red in the center and I used the three shades of green and loved the way it worked out so much that I continue to use this blending of glitter colors in my projects whenever I can. 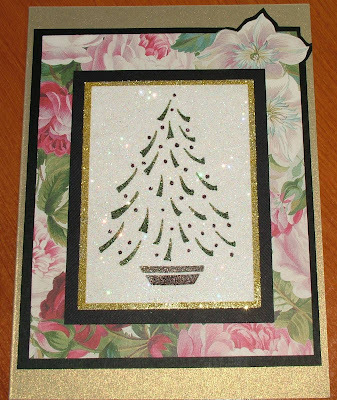 It's all a learning experience when you try something new and even with its faults it's still a very cheery card in person. I hope you guys give this one a try. 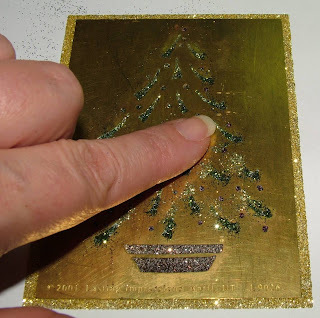 Just found your blog in a search for using glitter with brass stencils. Thanks for a great tutorial. I've only done one project using glitter with sticky paper. It turned out great. I hope to do more in the future and I will definitely keep your tips in mind. 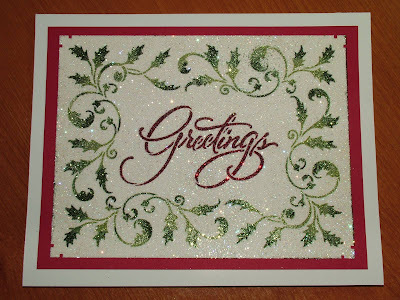 I'm so glad you dropped by and enjoyed the post. I plan on posting another tutorial using brass stencils, stencil paste and glitter in the near future so please drop back by again.